Whether you are keen to take your passion for diving and transform it into a career path, or you simply want to progress to the professional level of diving in order to refine your diving skills, at Action Scuba we offer a host of PADI professional development programs that will enable you achieve your goals. We are a 5 Star Instructor Development Center with a dedicated and experienced Go Pro training team comprised of our exclusive in-house PADI Course Directors, Roch Magnan and Gary Davis, and a team of Master Instructors and IDC Staff Instructors. A PADI Course Director is an instructor trainer, and this rank is the highest level of certification in the recreational diving world. There are very few PADI Course Directors in Canada, and at Action Scuba we are priviledged to have not one, but two outstanding Course Directors dedicated to our own Go Pro program! What's more, we maintain the highest standards of teaching and go above and beyond the minimum requirements in order to ensure that the professionals we certify are some of the best in the diving community. Our professional development courses are more flexible and oriented to your personal success than at other PADI centres and provide more hands-on experience with actual students and on our dive boat with real divers. Our goal is for you to become the best dive professional possible, and we believe that with our team training approach you`ll be better trained and have much more confidence. That's the Action Scuba difference, and your future students and customers will appreciate that difference. We also offer something few other scuba schools can offer: globally recognised professional IYT (International Yacht Training) courses that prepare you to work aboard and even captain a dive boat. We offer a range of courses from Diveboat Mate through to Diveboat Master, all of which can be combined with your PADI professional training curriculum to make you even more marketable. 2 dedicated, experienced PADI Course Directors backed by a great Go Pro training team. 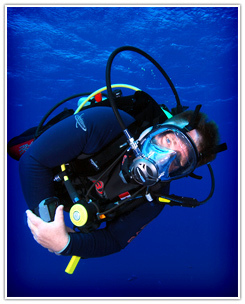 A mentor assigned to every Divemaster or Instructor candidate. Hands on experience with real students and divers. Opportunities to lead divers on popular dive sites on our own dive boat. Over 23 PADI Specialty Instructor courses to choose from to help you become a Master Scuba Diver Trainer faster. Fully bilingual training (English & French). Onsite support for the local PADI Instructor Exam from your Action Scuba Go Pro training team. Translation services for the PADI Instructor Exam (English, French or Spanish) provided free of charge by Action Scuba Go Pro training team. Flexible course schedule (day, night or weekend options available). A long tradition of quality over quantity, and leading by example. Very competitive pricing and packages. Discounts on complementary courses and equipment. Career counselling and assistance with job placement. A proven track record of producing some of the most well prepared dive prefessionals in Quebec, as evidenced by top of the class results by our candidates at the PADI IE, year after year. So if you're looking to be the best, why not push yourself to join our unique Action Scuba Go Pro program? Once you graduate, you'll be part of an elite team. You can pick and choose your courses and build up to become a PADI Pro over time, or you can opt to sign up for the entire Go Pro program at once, with significant cost savings. The choice is yours! And becoming a PADI Pro means that you can work anywhere in the world, as PADI is recognized as the leader in scuba diver training, as over 70% of certified divers globally learn with PADI. Talk to us any time to learn more. Get valuable career consulting advice for free! We offer free, no obligation one-on-one dive career consulting with Gary Davis, owner of Action Scuba and PADI Course Director, by appointment. If you're thinking of becoming a Divemaster or Instructor, your next step is to talk to us for some honest advice (not a sales pitch!). The reputation and quality track record of the PADI centre you choose for your professional development courses is important. We encourage you to do your research because we're confident you'll discover that for quality instruction without compromise, Action Scuba is your best choice.